G. Papoutsas auto-moto Rentals Company founded since 1999 in Kalafatis location of Mykonos (Myconos) Island Greece . Our Rentals Agency offers newest, safe and economy or luxury cars, furthermore newest and safe bikes to rent (hire) as well. In any case you're searching to hire (rent) a car or a bike in Mykonos (Myconos) Island of Cyclades Greece , then this is the right e-place for your rental booking. Best is a privately owned car rental company based on the island of Mykonos, Greece. 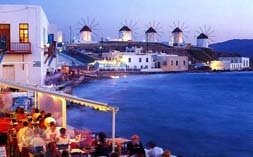 We have been renting cars on Mykonos since 1987. We are committed to giving our clients exceptional service and the most cost effective rental rates available. Our office is conveniently situated close to the main entrance of the town of Mykonos but we are very happy to bring your rental car to you. Action is the oldest car rental establishment within the island of Mykonos. Since its inception in 1975 ACTION has managed to grow in stature in order to become one of the undisputed leaders within the local market. The company was founded by professionals with a long experience in the car rental business. It started off with a small office and continuously expanded. After having covered the needs around the Athens area, they proceeded in establishing branches initially in Mytilini, later in Mykonos and then in Rhodes.